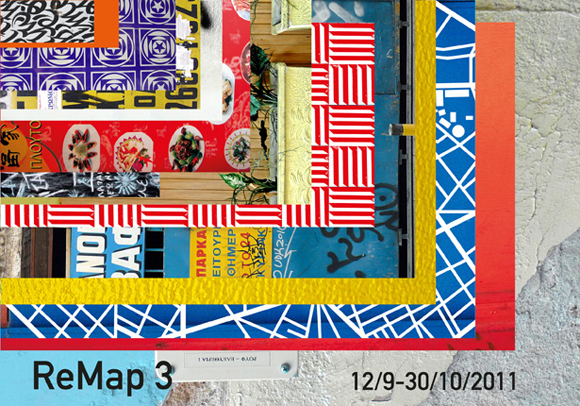 ReMap is an international contemporary art platform open and free to the public, which is held biannually in the area of Kerameikos-Metaxourgeio in Athens, in coordination with the Athens Biennial. It is organized by ReMapKM, a not-for-profit organization. The location of ReMap is central to its inception and implementation, as all shows, projects and events take place in a series of properties concentrated in one area, geographically defined by sub divisions of the Kerameikos and Metaxourgeio districts, one of the most central, historic, diverse, arresting, and yet deprived, areas of Athens. Remap KM’s goal is to create an alternative platform for the production and experience of contemporary art within the urban context, to present a real life interactive environment within a cultural framework and to enhance Athens’s positioning in the international contemporary art scene. In the light of the current social and economical situation in Athens, ReMap3—in its third manifestation—will present a dense and versatile programme of over 50 different exhibitions, projects and events by Greek and International galleries, cultural institutions based in KM, artists groups and independent curators from Greece and abroad. More information on the 25 independent projects also taking part in ReMap3 will be announced soon along with programme details.